Civil society advocates have long argued that greater transparency leads to greater accountability. Put more information in the public domain and it will be used to hold governments to account. Yet the causal chain between transparency and accountability may be only as strong as its weakest link. While a steady stream of evidence from the mushrooming domain of transparency and accountability initiatives show progress on information disclosure, traction toward greater accountability has been quite limited. That’s without even addressing the challenge of shrinking civil society space. Yes, “it’s too soon to tell.” But the challenges of civil society organizations using government information to improve accountability appear to lie deeper. Tactical, localized civil society initiatives tend to address the symptoms rather than the underlying causes of accountability failures. More strategic approaches may have stronger prospects for leveraging institutional change, especially if they take multi-level anti-accountability power structures into account. A recent Carnegie Endowment for International Peace blog post summarizes this proposition. It argues that, to achieve sustainable institutional change, civil society organizations and reformers must band together into coalitions that work at the local, subnational, national, and transnational levels. Such “vertically integrated” strategies must be keenly aware of the different levels of power — from the international level to the local level — and leverage these power dynamics to drive change. This is explored in greater detail in a new Issue Paper co-published by U4, The Anti-Corruption Resource Center, Government Watch in the Philippines, and American University. The paper finds that, to inform a new generation of strategies that take entrenched institutional obstacles more fully into account, a conceptual reboot is in order. Much like the momentum that has coalesced around Doing Development Differently, governance thinkers should be pushing for “doing accountability differently.” Strategies for improving accountability need to be grounded in stakeholder coalitions that are able to learn from both success and failure. In this context, the vertical integration proposition responds to a specific missing link in the transparency and accountability field: the challenge of how to bolster impact by taking scale into account. The core rationale for trying to monitor each stage and level of public sector actions is to locate the main causes of accountability failures and also to explore how they are connected. After all, the forces of impunity are usually already vertically integrated. Understanding as many links in the chain of public sector decisions as possible can help identify solutions. It can also help to forge and empower the coalitions that are needed to drive change. By attempting to take scale into account, vertical integration puts building coalitions between social and civic actors with complementary strengths at the center of the strategy. For example, infomediaries, plus membership-based civic organizations, plus independent media, plus insider allies (if available). But vertical integration is easier said than done. There are numerous challenges to coordinating different kinds of actors across different levels of governance, while bridging monitoring and advocacy. Scaling up is daunting for bottom-up initiatives, even though some degree of partial vertical integration can bolster leverage. Scaling down to coordinate with local actors can also take national initiatives outside their comfort zone. Conventional coalitions may be limited to groups that already know each other. There may be cultural differences between broad-based membership organizations and organizations geared towards technical policy analysis. Such organizations may lack experience in collaborating with each other to bring together their very different repertoires. Insider allies may fear any public criticism of the government. Holding such diverse coalitions together may require intermediaries familiar with different ways of working. Yet, if the underlying goal is to shift power toward citizens, strategies that can produce a whole that is greater than the sum of the parts are needed. The new U4 Issue Paper brings two different perspectives together in dialogue with each other. It does so to try to show how balanced collaboration and structured exchanges between scholars and CSO strategists can generate fresh analytical insights. The paper is complemented by the in depth analysis of Joy Aceron, the Director of Government Watch Philippines. Joy looks at the high-impact case of Text Book Count, an initiative to monitor and improve text book procurement in the Philippines. Led by Government Watch, the initiative brought together a coalition of government reformers and membership-based civic organizations to independently monitor the entire supply chain. This included contracting at the front end, production quality, as well as oversight of multiple levels of the Department of Education’s book distribution process, from the national level to districts to the vast majority of schools in the country. This case study shares a frank assessment of the initiative’s strengths and limitations. While it made major tangible gains, the CSOs involved were not able to sustain their national independent policy monitoring after they lost funding and senior policymaker allies. The monitoring was turned over to the government, but the independent validation of textbook deliveries was lost. It became impossible to know how much of the progress was sustained. 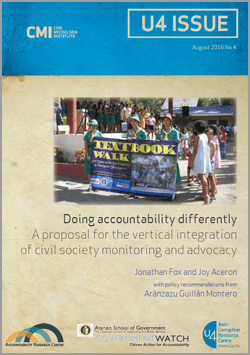 Yet Textbook Count is an exemplary case of vertical integration: it brought together national CSOs, government reformers, and broad-based civic organizations at multiple levels from across the country, and it combined comprehensive independent oversight with effective problem solving to reduce corruption and improve efficiency. This is a great new resource that is quite relevant to the work of IBP and our partners. The conceptual work on vertical integration, as well as a grounded case study, will be useful to many organizations and coalitions whose efforts cross multiple levels of governance. As this blog, and the full paper, makes clear, strengthening accountability entails connecting the dots from grassroots to state or national level, and leveraging complementary tactics (media coverage, budget analysis, mobilization). This is not easy, and many organizations struggle to construct such sophisticated campaign architecture and strategies, particularly in the context of short-term, project-based funding. But IBP’s own evidence supports this paper’s argument that there is no shortcut to accountability. It would be great to hear from other organizations about their reaction to these ideas, and their own efforts to put into practice more vertically-integrated strategies. The MDG challenge has helped bring millions out of extreme poverty. We have, and continue to be learning lessons from the 2001-2015 efforts. One important lesson, of course, is getting efforts started early, and listening and getting active participation from the voices of where development challenges exist. Indeed understanding how to build up the weakest links is a critical dynamic. Each community has its own weakest links, and what efforts are underway promote better government-citizen collaborations to tackle them? How might increased citizen participation, using the internet, cell phones and numerous social media platforms help in achieving successful SDG outcomes over the next 15 years? Are there ways to improve civil society collaborations and partnerships, working ‘at the local, subnational, national, and transnational levels’, to speed up the pace of development? I have just returned from a 5 week trip, visiting areas I last visied 20+ years ago in 4 southern African states. Progress had occurred, and opportunities for education were helping to improve lives. Only 6 days out of 36 was I not able to access the internet or use a cell phone, but found few ‘knowledge hubs’ (much less few trained public or private sector employees or businesses) available to citizens where they might find answers to questions to facilitate local development. Improving local citizens abilities to work together with their governments, building trust and improving relations were discussion topics I focused on, and was able to freely discuss in 3 of the 4 countries visited.